Debt Advisory Services (Scotland) Limited was launched in February 2006 in response to the rising levels of debt and a lack of organisations within Scotland that were providing face to face, online and telephone advice to help people become debt free. Having had many years experience in helping people become free from debt, we are aware that almost everyone encounters problems at some time in their lives, sometimes through no fault of their own. Browse the web and you will find endless lists of companies offering to help you to get out of debt. Debt Advisory Services (Scotland) Limited is approved by the Insolvency Service to undertake Protocol Compliant Debt Management Plans. This means that we will be able to continue to provide an excellent standard of service to consumers that are struggling to manage their debts. The Protocol Compliant Debt Management Plan has been introduced to protect and promote the needs and best interests of consumers who take out Debt Management Plans (DMP’s) and to drive up standards in the Debt Management Industry. Although we are a fee charging, professional debt solution company, unlike many of our competitors, we do not charge any arrangement fees or higher monthly management fees during the first 6 months for arranging your debt management plan. Rather than charging a percentage of your monthly contribution as a management fee, our fees are based on the number of creditors included in your plan and the amount of work involved in managing your plan. We are an independent organisation, 100% owned and operated in Scotland. We are regulated by The Financial Conduct Authority (FCA) and Licensed under the Data Protection Act. We provide practical debt advice and solutions which are individually tailored to our client’s personal circumstances and we look to find the quickest and most effective way of getting them free from debt. Debt Advisory Services (Scotland) Limited are members of the trade body, the Debt Resolution Forum. 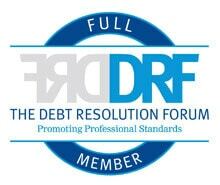 Members of the Debt Resolution Forum are committed to giving quality advice by identifying the best solution for their clients after considering both their financial and personal circumstances. Download our free debt help guide by completing the short form above. Ring us on 0800 011 2322 (free from landlines) or on 0141 956 4088 to discuss your situation with one of our fully trained advisors.